This is a pretty impressive 30' waterfall on the Nedd Fechan (little Neath) river. 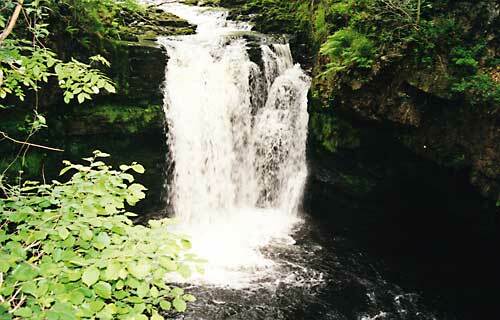 Glyn Neath, for the name of this waterfall (Lower Ddwli fall). It is sometimes called "The Rainbow Falls," as a rainbow forms in the spray when the sun is in the right position. Send mail to feedback with questions or comments about this web site.